It’s hopeless. Part of the problem is, Bleeck loves to do this full-body-glom-on-Finney thing. He leaps onto Finney’s back, wraps his legs around Finn’s belly, and will not let go. He looks like a bizarro kitten-cape. An evil kitten-cape, because he’s biting Finn’s neck the whole time. I’m sure he isn’t hurting him, or at least not terribly. He does a similar thing to my arms and legs. The funniest thing is he purrs the entire time he’s doing it. I’m so happy, chew, chew, chew, this is the best, purr, purr, purr, mwah-ha-ha. Feeding time. Bleeck has to have all the food, of course. I should separate them, but Finney eats a few bites at a time, rests, eats some more. I’d have to separate them for a long time which would make both cats miserable. Each cat quickly gets bored with whichever room they’re in and they like to roam. This is me attempting a mini-separation. 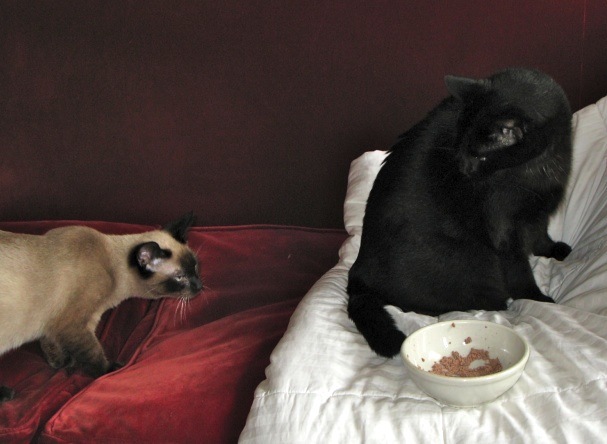 Bleeck’s food was in the kitchen, and Finney’s food was on the … couch? Good lord, what was I thinking? Well, food on the couch is better than throw up on the duvet which is what I got from Joe this morning. That’s exactly how I feel about all (9) of my cats: they are hopelessly adorable and annoying at the same time. 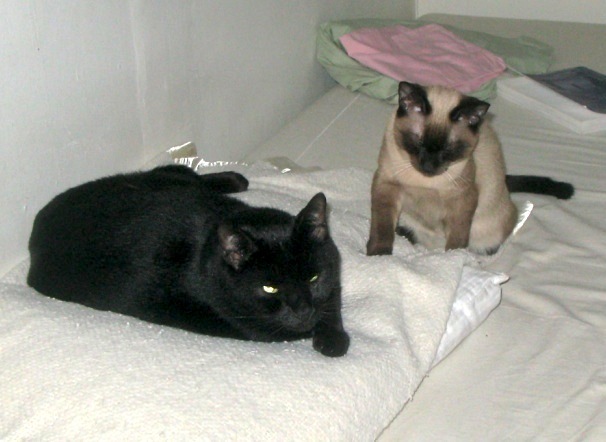 I’ve never had a Siamese but I’ve promised myself that the ext time I get to choose a cat (all my cats are off the street rescues) I want a Siamese. That Bleek, he is one handsome dude. I feel tremendous guilt about Finney, who should be enjoying a peaceful old age, and now he spends a lot of the time hiding. I have to figure a way to turn this around. I’d not worry too much about Finney. My hunch is that he rather enjoys Bleeck’s company in a twisted sort of way. I’ve grown fond of Bleeck, but I was worried about something like this. No matter how much we love them, cats are still cats, and animals are still animals. I’ve known some cats to become so out of control that the only option was to farm out the aggressive cats to new homes. Obviously, at this juncture, Bleeck is just reproducing kitten play, which is no solace for poor Finney, who did not volunteer for this activity. It is possible that as Bleeck grows older, the play might turn into legitimate aggression. You know, a lot of their play is practice and warm-up for hunting and defending. My first exposure to your site was during a period when Finney was being highlighted, and he gained my admiration and respect. I would be disappointed if a solution could not be found. Yeah, I definitely need to play with Bleeck more. They also spend a lot of time sleep in the bed within inches of each other, so I think all is not lost.